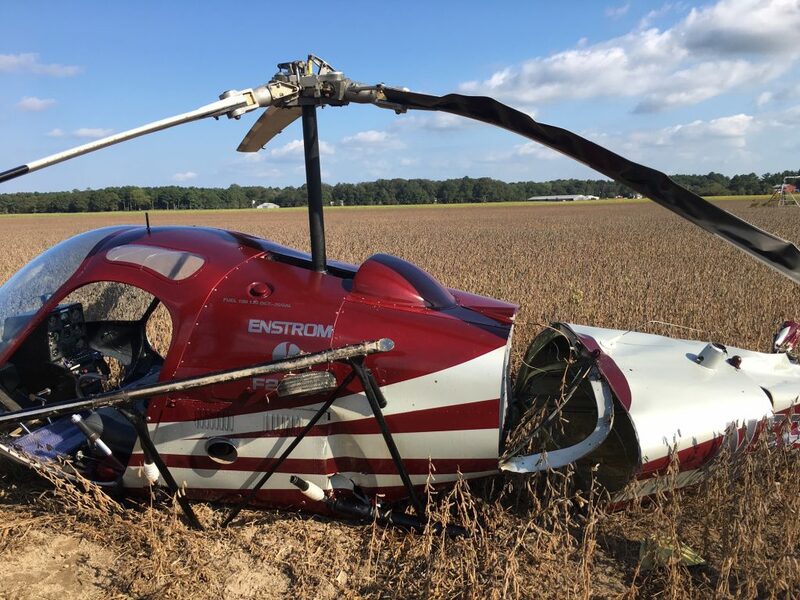 On October 7, 2018, about 1340 eastern daylight time, an Enstrom F-28C helicopter, N5691Y, was substantially damaged when it impacted terrain shortly after takeoff from a field in Bridgeville, Delaware. The commercial pilot and three passengers were not injured. The helicopter was operated by J&J Shop HeliAir LLC., local sightseeing flight was operated under the provisions of Title 14 Code of Federal Regulations Part 91. Visual meteorological conditions prevailed, and no flight plan was filed for the local flight. According to the pilot, during takeoff with power lines nearby, he increased the throttle to the maximum engine and rotor revolutions per minute (rpm), and began a climbing left turn, where he subsequently noticed a "slight decaying of rotor rpm." While headed toward the power lines, he "slightly" reduced the collective, while increasing the throttle, in effort to increase rotor rpm, but the power application did not increase the rotor rpm. Nearing the power lines, he reported that he "pulled collective" which "further degraded" the low rotor rpm state, as the helicopter cleared the power lines. After clearing the power lines, the helicopter was about 50 to 75 ft above ground level, and the engine and rotor rpms were "well below minimums." With the helicopter sinking, the pilot pulled "full collective" just prior to impact with terrain, and the helicopter touched down hard. According to a Federal Aviation Administration (FAA) inspector who examined the helicopter at the accident site, the helicopter impacted terrain about 1,000 ft northeast of the departure point in an upright configuration. The tail boom had separated from the fuselage, which resulted in substantial damage to the tail rotor drive shaft, tail boom, and tail rotors. Control continuity was established for the throttle, cyclic, and collective controls. The helicopter had about 18-20 gallons of fuel on board. The inspector reported that the operator held an FAA Letter of Authorization to conduct commercial air tour operations under Title 14 CFR Part 91.147. According to FAA airman records, the pilot held a commercial pilot certificate with ratings for helicopter and instrument helicopter. His most recent second-class medical certificate was issued in September 2018. According to FAA airworthiness records, the helicopter was power by a Lycoming HIO-360-E1AD, 205-horsepower engine, and had 3 seats. The weather conditions reported at 1332 at Dover Air Force Base, Dover, Delaware, about 25 miles from the accident site, included wind from 240° at 6 knots, visibility 10 statute miles, scattered clouds at 2,400 ft above ground, temperature 28°C, and dew point 22°C. The helicopter was retained for further examination. Operator: J&J Shop Heliair LLC. 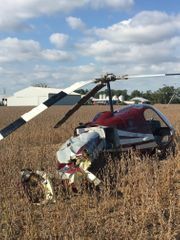 A helicopter crash-landed in a soybean field near Bridgeville Sunday afternoon. There were four people in the helicopter including the pilot, according to State Police. The passengers, a 41-year-old woman from Lewes and two children ages 7 and 4, were taken to Nanticoke Memorial Hospital as a precaution but were not injured. The crash took place during a fall festival at Evans Farms on Seashore Highway, police said. The helicopter, a 1981 Enstrom FA28C with approximately 15 gallons of fuel, took off about 1:37 p.m. The pilot, 62, of Bridgeville, reported the rotorcraft lost power as he cleared irrigation and electrical lines, according to State Police. The helicopter traveled approximately 300 yards east before making a hard landing in an adjacent soybean field, State Police said. J&J Shop Heliair was scheduled to provide helicopter rides at the festival, according to Evans Farms' website. The helicopter tour company could not immediately be reached for comment. According to its website, owner Jay James and his staff of five pilots give tours in both Maryland and Delaware, as well as offering flying lessons. They have locations in Milton and Berlin, Maryland. Evans Farms also could not immediately be reached for comment. The National Transportation Safety Board and Federal Aviation Administration will investigate the crash, State Police said.